Ultrahigh Vacuum Practice covers topics about components suitable for ultrahigh vacuum applications, their theory of operation, their assembly and use, and their performance and calibration. 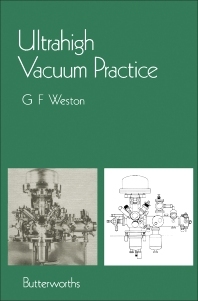 The book starts by discussing the fundamentals of vacuum science and technology. The text then describes the physical properties and methods of preparing the materials for ultrahigh vacuum and the various pumps and their performance and application to ultrahigh vacuum systems. The mechanism and performance of the various ultrahigh vacuum gauges and the problem of gauge calibration at low pressures, as well as the accuracy that can be expected are discussed as well. Partial pressure measurements, ultrahigh vacuum components, and liquid nitrogen replenisher are also considered. The book tackles the system requirements and applications, as well as methods for detecting leak. Users or potential users of ultrahigh vacuum equipment and expert vacuum engineers will find the book useful.